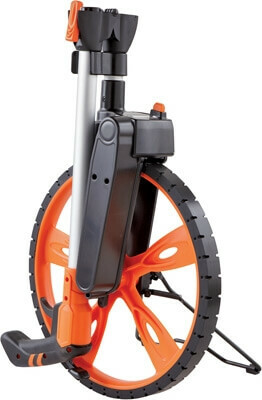 The Keson Road Runner RRT12M measuring wheel is ideal for asphalt paving, cable installation, lawn maintenance pros, irrigation design and installation, landscape design, law enforcement and telecom. Re-set on the handle and on the unit housing - no more bending over, lifting the wheel or stepping on it to reset to zero. Additionally, the re-set on the housing is reinforced to protect it when re-setting the counter with your foot. Brake on pistol grip - stops counting instantly. Stop adding lengths accidentally by putting the brake on exactly when you need it. Collapsing hinge - snaps into extended lock with the flick of the wrist and it disconnects if you forget to press the unlock trigger. Center-line handle design with counter on top of wheel - center of gravity aligned for perfect balance. This makes measuring easier and more accurate. The raised counter makes reading it easier. Compact fold-down - easily reduces to half its size for storage and portability. Storage is a snap. Flip-down kickstand - keeps the wheel upright when you need your hands free to perform other tasks and stays out of the way as you measure. Gear and shaft transmission for highest measurement accuracy and strength. No belts to stretch or fail. Handle lock - lock your handle in place when you're not using the wheel. Our clamp protects the extension hinge from breaking.